You are here: Home / Uncategorized / Is Invisalign Right For Me ? Invisalign® is the clear alternative to braces by treating crooked and crowded teeth in adults in teens. Customized to each patient’s needs, Invisalign® uses a method to efficiently and comfortably move to teeth to make them straighter can healthier. Ever notice how someone with a nice smile, makes you want to smile? A beautiful, healthy smile will make a hugely positive impression on your life and those that you come in contact with. A beaming straight smile will improve not only how others perceive you but how you see yourself. People donning bright, perfectly aligned healthy teeth show higher self-esteem and radiate confidence. Many adults, in addition to teens, and children have improved their lives and their health by getting their teeth and their bites corrected. Believe it or not, straight teeth are actually healthier teeth. The reason being straight teeth are likely to get fewer cavities, have a lower risk factor for discoloration, uneven wear and fractures. Your gums are healthier too and reducing your chances of developing periodontal (gum) disease. Another bonus is you can chew anything you want when your teeth are straight and your gums are healthy. People with corrected teeth have less sensitivity to heat or cold and you reduce the risk of other painful and expensive dental problems. Invisalign® is an appropriate solution for those that are embarrassed by crooked or crowded teeth or do not have optimal oral health. Those with careers in fields where they meet new people such as sales may choose this method of treatment over traditional braces for aesthetic reasons. Dr. Mothana Al-Taee will let you know if this solution will fit your needs. 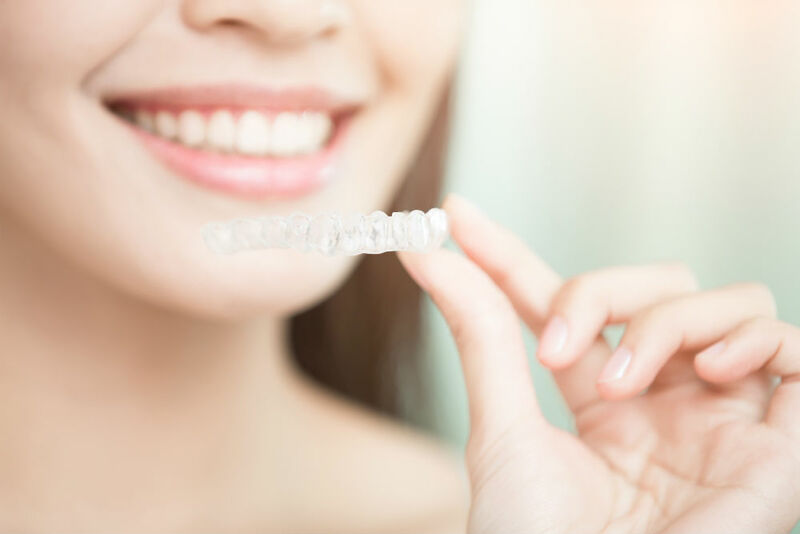 Invisalign® uses a series of custom-shaped, plastic aligners to correct the position of teeth and are so discreet most people will not ever notice them. While the detailed number of Invisalign® aligners needed to achieve optimal results will depend on your unique orthodontic needs, each consecutive aligner will be created to apply the necessary pressure to guide your teeth to their ideal position. Each retainer will be worn for about two weeks before it needs to be replaced. Overall, the course of treatment should require about the same amount of time as treatment with traditional braces. Aligners should be worn 24 hours a day, except during meals and while brushing and flossing. If moving your teeth without the whole world knowing you are undergoing treatment sounds ideal, Invisalign may be your answer. Once treatment is complete, your trays are no longer necessary. A retainer will be required to be worn each day to protect your new smile. As always it is important to maintain routine dental check-ups and twice-yearly cleaning. Why Choose Heron Park Dental? Looking for an expertly trained and friendly dentist in the Nepean, Ottawa, Canada? Look no further than Heron Park Dental. Dr. Mothana Al-Taee and his team at Heron Park Dental genuinely love to see you smile. They take great pride in practicing the most up-to-date cosmetic dental procedures in a comfortable, welcoming atmosphere, practiced by the most knowledgeable and experienced cosmetic dentists in the field. They know when they see you smile that is the sign that they have done their job, giving you the highest level of care in the industry. If you or a loved one are looking straighten crooked, misaligned teeth without the look of traditional braces, please call Heron Park Dental for an initial appointment and consultation! http://heronparkdental.com/wp-content/uploads/2018/03/invisalign_heronpark.jpg 667 1000 mahrez http://heronparkdental.com/wp-content/uploads/2016/08/logo-300x95.png mahrez2018-03-05 21:45:402018-03-05 22:02:08Is Invisalign Right For Me ?